Crude oil prices have dropped by nearly 60% since June 2014, and they're set to reach at least $35 before they see any significant rises again. That's boosted the South African economy in two main ways. 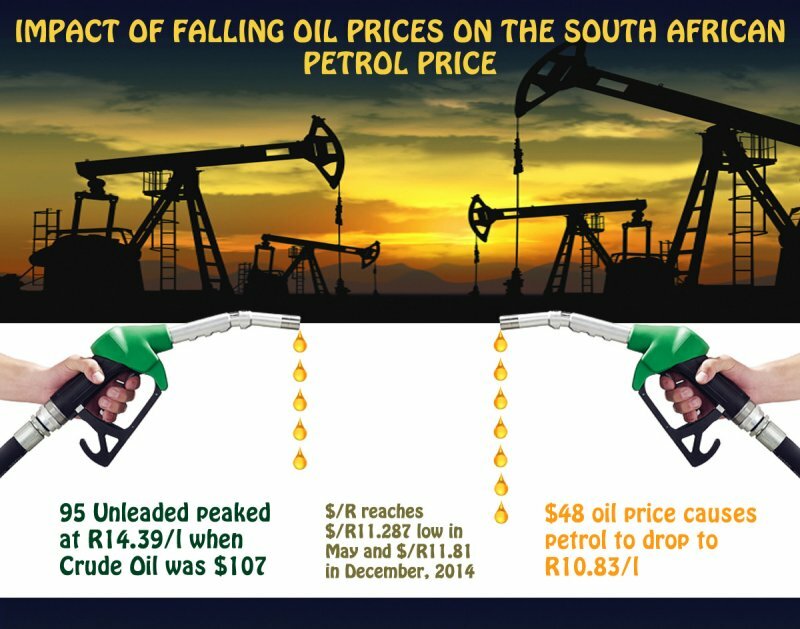 The first is that we all pay less to fill up our cars than we did this time last year when the price of 95 unleaded was at R13.50 inland and peaked to 14.39 in April 2014, to the lows we see today. Forecasters expect retail prices to settle at R10.50 in South Africa if the country is to enjoy the full benefits of lower global oil prices, of which petrol and diesel are just two products. The second boost is a lagging effect in the form of general inflation as per CPI indices. The drop in fuel couldn't have come at a better time because retailers can pass their own transport cost savings onto us consumers, thus lowering prices of everyday items like food and beverages, and clothing items – all of which are big hit items in the December/January season. In America, the fall in the prices at the pumps has led to an increase in vehicle sales in 2014 last seen in 2006! This has been bias to more the fuel-thirsty SUVs and bakkies that are so popular among Americans – young and old. If South Africans where to act like Americans with this regard, that would be great for the county's major car companies based in cities like Pretoria, Durban and Port Elizabeth – all of whom would record stellar revenues. However, that has not the case, and as seen from this most previous December's numbers, car sales for the month where very subdued. Clearly, unlike Americans, we are not swayed by the temporary impacts of lower oil prices to buy more cars. Think about it: if prices where to start rising and you can bet my bottom dollar they will, then just as all other goods and services in the country have become cheaper, those same items would just as quickly become costly again. You however, would still be stuck with car repayments for example, and a greater cost of owning that car due to petrol being more expensive. Another reason why South Africans may not have been as quick to buy more cars is that banks aren't as willing to extend car finance. That would make sense from a bank that forecasts this sudden dividend from cheap oil to be temporary. The benefits of crude oil at below historic prices is no doubt great, and would be more beneficial if the rand/dollar exchange was at low levels which makes importing oil cheaper. However, much caution should be taken if you consider buying big ticket items like on only the basis that petrol is cheap – this just won't last. Sound financial planning is what you will need.